Scottsboro. It's Not For You. When you live somewhere for an extended period of time, you develop a relationship with that place that is very much like being in a relationship with a spouse or significant other. Over time it is easy to begin negatively comparing your community with other cities and towns. You start to see all the problems and none of the blessings. I get that. We all do it. The negative comments sound something like this. We don't have a Publix or a Cracker Barrel. We need a Chik-fil-A. There's not enough for teens to do. We don't have enough night-life. We have too many pot-holes, too many churches, too many retired folks and not enough industry. The mayor and the City Council don't want progress. The police don't fight crime. And there are too many nosy people in this town. You get the idea. You are a winter person. If winter sports are your thing, Scottsboro is not your kind of place. We have mild winters, not much snow or ice and on the rare occasion that we do get snow, we flip out. We call off school, make a run on the grocery stores for the snowpocolypse we think might be coming, even though history tells us it probably won't be as bad as it sounds and hunker down like bears in a cave. Winter folk won't like it here. Better head north. You hate living close to both mountains and lakes. If you are a desert or tundra type of person, Scottsboro is not going to make you happy. Mosey on. You don't like fishing, boating, swimming, water skiing, or hunting. There is way too much water and woods here and the residents are always involved in all of those activities. Better keep going. Scottsboro will make you miserable. You don't like hiking trails, caves, scenic drives or any other activities that involve enjoying the beauty of the great outdoors. Seriously, mark Scottsboro off your list. You hate history. Scottsboro is rich in history, both good and bad, but we acknowledge it, teach it and try to learn from it. Beginning with the Cherokee tribes who originally occupied the land but were driven out on the Trail of Tears, through the devastating years of the Civil War and the long hard fight for Civil Rights, this place is steeped in history. The County Courthouse that was the site of the original Scottsboro Boys' trial, the Scottsboro Boys' Museum, the Scottsboro Depot Museum and the Scottsboro-Jackson Heritage Center will put you into a history coma, so if that's not your thing, keep-a-rollin'. You don't like raising your children in a safe place. 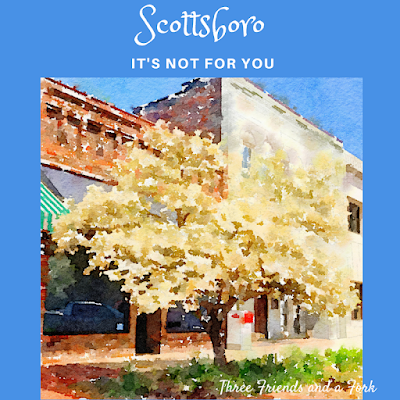 Our kids don't have to learn to drive on eight lanes of interstate traffic, they can walk the streets of downtown Scottsboro without being attacked by gangs, the schools are safe and people pretty much watch out for each other. If all of that sounds boring, you better move on. People in Scottsboro like to help one another. If someone is sick, hurt or dying, folks in Scottsboro are going to set schedules for round the clock care, form committees to bring food and carpool kids and organize prayer chains to get help from a higher power. If you don't want Aunt Bee standing on your doorstep with a poppyseed chicken casserole when you bring your newborn baby home from the hospital, you better settle down somewhere else. If the idea of a store that sells millions of items from lost airline luggage sounds horrible to you, pick another town. Scottsboro's Unclaimed Baggage is the world's only lost luggage store and Scottsboro's residents are mighty proud of it. People come from near and far to score a bargain at the behemoth store. If you like living in a place with high unemployment, you will not like it here. Scottsboro's unemployment rate is very low, between 4 and 5 percent. How boring would it be to live in a place where most everyone has a job and goes to work on a regular basis? If creativity is not your thing, Scottsboro is probably not for you. We have artists, writers, musicians, singers, photographers and actors. Seriously, they are everywhere! Surely you will be more happy somewhere else. Finally, though I am sure I could come up with many more things to add, if you hate good food, don't come to Scottsboro. We have several barbecue restaurants, restaurants with views of the lake, Mexican restaurants and restaurants with good Southern cooking. We have a coffee shop, a bakery and an old-timey soda fountain. And let's not forget all the home cooks with their Aunt Minnie's recipe for chess pie or their Mee Maw Moses' famous Lane cake. No, if you are one of those people who subsist on rice cakes and kale chips, I'm sure you can find a town more to your liking in California. Go west, young man. Pretty horrible, huh? Even I had no idea how bad we have it here in Scottsboro! Good thing I made that list!